Carl’s presence fills any room he enters. Not because his ego pushes others out, but rather his demeanor welcomes and connects with everyone around him. In title, he is the President and CEO of Autodesk, a $2 billion corporation that creates 3D design software that's used around the world. In practice, he’s a DEO. We interviewed Carl one sunny afternoon in the Berkeley shop he shares with a friend. Surrounded by traditional wood working implements, repurposed discards, and a state of the art robotic lathe, Carl explained how he built his career and crafted his life. As a child, what did you think you would grow up to become? I don’t think I ever spent any time as a kid thinking about what I wanted to be. I never thought, “I’m going to be a fireman, I’m going to be a whatever.” I mean, I have always just done the thing that is most interesting in front of me. It was more of a meander. There was nothing purposeful about it. When I first went to college, I only went for a brief time and decided I hated it. So I dropped out and ended up in South Dakota. I was just driving across the country with a friend and we ran out of money some where near Wounded Knee. I stayed for about a year on the Indian reservation building houses and learning how to do carpentry. Next I wandered over to Seattle. I kind of poked my nose into a woodshop there and asked, “Can I come and sweep up the chips or something in exchange for using your shop space?” That’s where I taught myself how to make stuff. Then I apprenticed with a blacksmith. Next I learned to build boats and furniture. I finally went back to college, but I spent probably five, six, maybe even seven years between when I started and when I finished. I’ve always tried to figure out connections. That’s how I think of creativity and that’s the common thread that goes through everything I do. Whether it's a design problem or a math problem or anything else I do at work, it’s all about solving a problem or a challenge by figuring out the connections and working within some constraint. You’re trying to figure out an answer. Math is exactly that. Design is that. And business has a huge aspect of doing that. You have a whole bunch of constraints and in those constraints you try to find a reasonable answer. That’s my sense of creativity. When did you first realize you could lead? I’m a reluctant executive. I never wanted to be a CEO. I don’t understand someone who just wants to be a business executive and so they move from company to company to rise up the ladder. I don’t understand that motivation. There are many parts of the job I don’t particularly like. And so I’ve surrounded myself with people who are good at the things I don’t like doing. I’ve always tried to find the people who enjoy doing the stuff that I don’t like doing. I think I started as a more heroic leader, where I was going to try to lead the charge and solve the problem. But in a big company, the leader can’t do the work himself. I can’t pull together six smart people working really hard and run Autodesk. So over time, I’ve become much more collaborative. Partly by conscious change—working with coaches and becoming more aware of my impact on people—and partly I think just from growing older. Now I find myself a fair amount of time sitting at work thinking “I’m really here for them, my employees.” I’ve become much more willing to discuss philosophical questions or to show someone how I thought about a problem or to give my perspective. I think it’s a lot like being a parent—you learn to pass on knowledge and to pass on skills. They'll take what they want from me and will get rid of much of it. But, you know, it's a way of influencing. I used to only be interested in the work that people did. My attitude was kind of “school of hard knocks.” I was much more selfish about my time. I didn’t want to waste it explaining stuff. If you’re smart enough to get it—great; if not—too bad. I could be ridiculously critical and unashamed to say it. I didn’t realize that if you care more about people, you get better work. Over time you learn it's reasonable to care about people. People have careers. They have aspirations. They have stuff they want to accomplish. And having a little empathy for them doesn’t kill you. If you invest in them early on, mentoring or teaching, the benefits of it are off the charts. 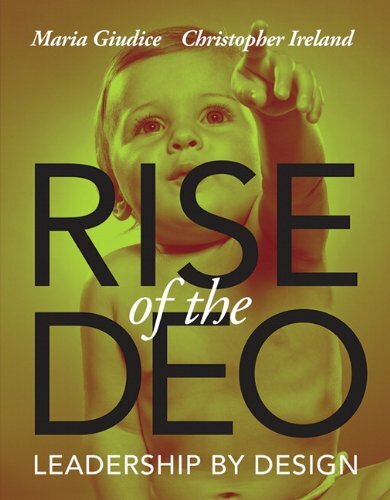 You can continue reading Carl’s interview along with six other DEO profiles in our new book Rise of the DEO: Leadership by Design available in print, ebook and Kindle formats on Amazon, Barnes & Noble, and other retail book sellers.